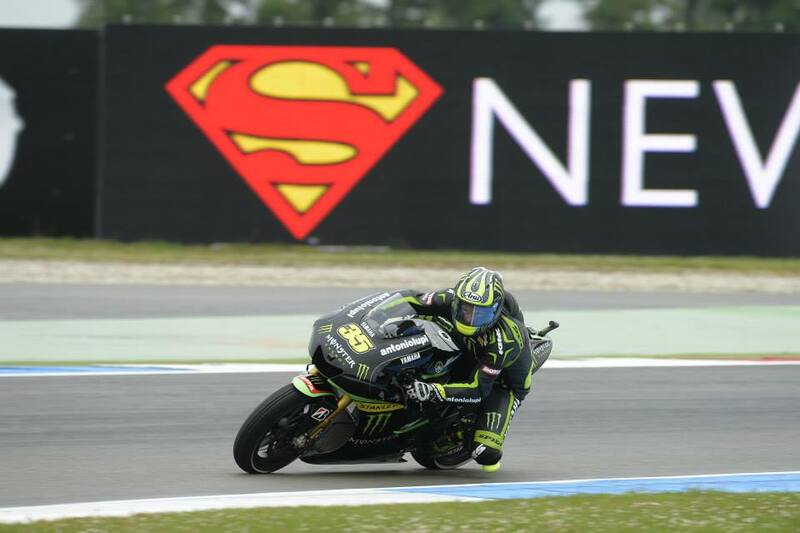 The weather was bleak and still slightly damp in the morning of qualifying day at Assen, meaning that little action occurred in FP3, despite a dry line beginning to form toward the end of the session. It was obvious, given the conditions, that the times set in the dry from Thursday morning’s FP1 were to be used to determine which riders were seeded through to Q2 and which riders had to endure the 15 minute Q1 session prior. The second half of the third free practice was used by some riders an in attempt to perfect their setup prior to the afternoon’s qualifying and/or for tomorrow’s race. Marc Marquez was the first rider to venture out of his pitbox on slick tyres, as suggested and permitted by his team. After completing his out lap with no issues, the rookie highsided his RC213V in 5th gear the next time around at Ramshoek with the bike landing on top of him, causing fractures to a finger and big toe… a lucky escape indeed for the twenty year old. Bautista topped the session some six seconds off the pace, followed by de Puniet, Pirro, Silva and Marquez rounding out the top five. As mentioned earlier, the less than ideal conditions since yesterday morning at Assen meant that the first free practice times determined who had to participate in the Q1 session this afternoon; in this case, three out of four Ducatis were doing the rounds with the CRTs – Dovizioso, Hayden and Iannone. The prototypes largely dominated the session, only being challenged by de Puniet, Petrucci and Barbera. The session ended with de Puniet and Hayden making it through to Q2, with Iannone and Dovizioso out after Dovizioso was held up by Barbera on a flying lap and Iannone binned his Pramac GP13 thirty seconds before the flag came out. As a result of the incident between Dovizioso and Barbera, the Italian struck his leg out at the Blusens rider on the cool down lap, we’d expect to see some action taken by Race Direction in response to this. The proceeding Q2 was one of the most exhilarating qualifying sessions seen in a long time, with Brits, Germans, Spaniards and Italians all having a rider in with a shout of pole position in the dying seconds as the chequered flag came out. Marquez was first to top the pile, evidently unfazed by his horrifying incident from this morning but was quickly knocked off his perch by Crutchlow. They were followed by Rossi and Espargaro in 4th with ten minutes to go. After his fantastic performance in Q1, Randy de Puniet on the Aprilia CRT found himself up to 6th place after five minutes. Cal Crutchlow wasn’t far behind the Frenchman and took top spot very briefly, before Pedrosa made an appearance, clinching 1st by seven thousandths of a second. His success was also short lived as no less than a minute later, the championship leader tucked the front going into turn nine, putting an end to his bid for pole. With a minute to go, Bradl moved into provisional pole ahead of Rossi in second and Pedrosa, relegating Crutchlow to fourth. Meanwhile, Marquez found that he had caught Bradley Smith as their bikes became squirrely under braking and Marquez nearly torpedoing the Brit into turn one. After the Spaniard had regrouped, he and Crutchlow were able to make it across the line before the chequered flag came out for a final flying lap; Marquez crossed the line first taking pole, but was shoved firmly into second place by a lap time four tenths quicker from Crutchlow. This was the Brit’s first pole position in MotoGP. This meant that Bradl was pushed down to 3rd for tomorrow’s grid, Rossi 4th, followed by Pedrosa, Smith, Espargaro, Bautista, de Puniet, Hayden and Pirro. Despite rumours that reigning-champion-walking-wounded Jorge Lorenzo would like to race on Saturday if he is passed fit to ride by Medics, unless the Spaniard can conjure up a performance identical to that of Shanghai 2008, he is effectively out of the equation for the race win. So who will capitalise on his absence? The Repsol Honda duo are a standard ‘safe’ choice for podium finishes nowadays, despite Pedrosa’s off in qualifying and Marquez’ attempt at flying on his RC213V this morning, the two easily have the pace to be top three. However, though it may sound cruel, the Yamaha pair of Rossi and Crutchlow will be rubbing their hands with anticipation at the thought of a Lorenzo-less race and at the moment they’re looking equally as strong, if not stronger than the Hondas around the Assen circuit. Rossi has said this weekend that his race pace is good, he has a much better feel with the bike since his ‘eureka!’ moment in the Catalonia test and today was his best qualifying since his return to the Japanese factory. This would be his best opportunity for a race win, yet. Then there’s Crutchlow, after today’s performance alone taking pole by four tenths, he has to be a favourite for the win with this, like Rossi, being the best opportunity for him to do so. The Brit has matured even more so this season, so don’t expect him to crumble under pressure – he could have done that in France where he got 2nd, or even qualifying today, but didn’t. Have faith British race fans, you may well get to hear your national anthem on a premier GP class podium tomorrow for the first time since the Barry Sheene days.